My husband (who came home exhausted, but glad to be back) did a really good job with bringing back gifts from the conference in Hawaii. 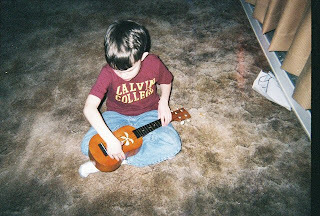 The ukulele was a hit with our older one as you can see. The little one received a pouch of little stuffed marine animals, a shell necklace that dad received as a freebie, and a set of three little inter-stacking treasure chests. We each received a t-shirt and a box of chocolates and pineapple-shaped cookies to share. Gifts aside, we are all glad to have him home again. Me too. Glad we had a brief reprieve from bad weather to ensure safer travels. All the schools are cancelled today as a result of last night's ice storm. hello! the other night on pbs frontline they did a documentary on a man in his 20's with asperger's syndrome and it was really well done and i certainly learned a lot. i think you can access those videos online if you were interested! My husband always wins points when he brings something back for the kid on one of his trips. P.S. I like this photo, btw. Very cute little guy you have! To Frylime: Thanks for letting me know. Videos don't come through all that well for me on my computer, but I may research the doucmentary out of curiousity. To Holly: My youngest already knows to expect something from his dad who is a real softie. Glad you liked the photo, though the composition was off a bit.